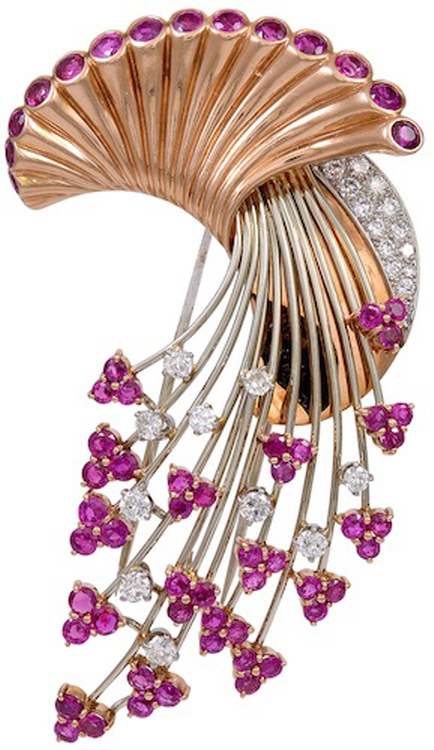 Art Deco 'Retro' Ruby and Diamond Brooch. This platinum and gold floral-motif is set with 25 round brilliant diamonds and 62 round rubies. The total diamond weight is 2.25 carats and the total ruby weight is 7.8 carats. The brooch measures approximately 3.375 inches long and 1.875 wide. The brooch is in excellent condition.